Crazy Spinners will have your cat pouncing and batting for hours. Spin them, Slide them, Bite them and Bat them around the floor. Made from hard plastic. 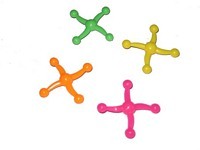 These toys are shaped like wavy “X”s that are lightweight and provide hours of fun for your cat.